Join other international stove builders, promoters, and scientists, and see the technologies and methodologies developed in China to meet their improved stoves initiatives. Time-resolved CO and PM data enable characterization of peak pollution periods. Diversity of fuels within single village facilitate investigation of fuel- and stove-related factors as well as tobacco smoking as determinants of indoor air pollution. Though 24-h CO well within standards, a substantial fraction (27%) of peak 1-h episodes exceed WHO’s 1-h guideline & outliers surpass OSHA’s evacuation threshold. Short-term resolution is critical for characterizing acute risks posed by CO exposures in rural kitchens. 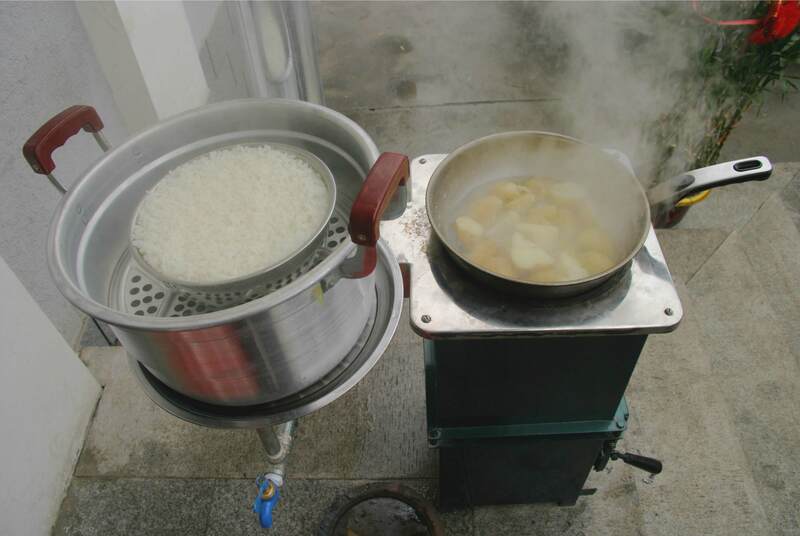 Adoption of “improved” cooking fuels does not suffice to reduce indoor air pollution where heating dominates fuel use. Health-oriented interventions limited to provision of improved cooking fuel are insufficient in cold climates. scrap pipe or rolled metal sheet. dramatic reduction in particulate emissions - certainly more than 90%. This principle is not only limited to Zambia, it is pretty widely applied by other charcoal users in the region. At ETHOS 2009 we held a panel on stove safety, bringing in viewpoints from corporate standards development, national standards certification, and small to medium scale developers. The team led by Nathan Johnson (Iowa State University) included Crispin Pemberton-Pigott (New Dawn Engineering), Casper Thijssen (Philips), and Karabi Dutta. We determined that each type of industry has a different perspective that influences their path or actions towards a safer stove. And that all sub-industries may not produce safer stoves given the same incentive mechanisms or policies. As such more than one path to safety may be needed to reach the greatest amount of end-users (and producers). The panel ended the discussion with an overview present work in stove safety with recommendations for next steps. Please view the attached file for more details. I will be leading a group in 2009 to work on the following: assemble database of injury data, b) analyze incentive mechanisms, cost/ benefit, c) development of lab testing procedures for different stove categories, d) publication of findings/ results, and e) look for partnerships with international agencies to support safer stove design and production. This is a simple way to convert fibrous material with moisture of less than 25% to clean energy and charcoal or Carbon Negative Energy!!! Manually-operated biomass pelletizer - clay as a binder? 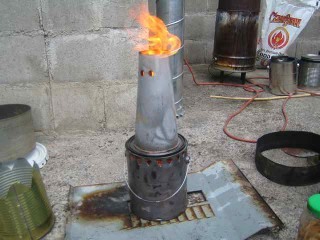 A lot of the folks on the List saw the Rocket stoves that we are making in China at ETHOS. John Page and I just spent ten days at the factory near Shanghai. Here’s a quick update on the China project. The big news is that the lightweight, refractory ceramic combustion chambers are now being extruded at the rate of about one thousand per day. You can imagine that John and Dean were grinning ear to ear, watching the materials being mixed three times in the big grinders. When thoroughly mixed, the clay is extruded into the combustion chamber shape, pushed by a 100HP motor, and every twenty seconds or so, another combustion chamber is ready for drying. (There are photos of all this.) Drying takes about 30 days and then firing takes place in the huge coal fired kiln, as big as a supermarket. I think that we can fire about 20,000 combustion chambers at one go. The kiln is being fired and emptied simultaneously. The clay deposit is located one kilometer from the kiln. The cast iron stove top was adjusted; raising the pot supports two millimeters, after further emission testing in the lab showed a reduction in CO and PM with a little higher clearance. We have the first order for a container of stoves, which is going to India. The factory has arranged for a good set up price (about $600) for the packaging. The six sided box can be printed in the local language with desired designs and logos. We are investigating shipping costs to and duties for all countries. There are different duties for whole stoves and for stove parts. We’re going to write up our experience and send it around to everyone, bit by bit, trying to share what we learn from this project. I've just been playing around with my natural draft stove to see how easy it would be to use it for cooking and making charcoal. I fed some extra fuel in the side to show the pyrolysis reaction taking place.